Crystal Coast weddings and receptions can take place at so many beautiful venues indoors, outdoors, next to a giant fish tank or amongst local history. Where ever you are hosting your event, every venue is unique. Decorating your event sets the tone and mood for you and your guests. Whether you are looking to recreate a feeling or to have an unforgettable experience, picking the right decorations is key. Here are some things to think about. What is your personal style? Are you laid back, casual, trendy, sophisticated or romantic? You may want an evening wedding with rich hued flowers and glowing candles. Or a more contemporary setting with lounge furniture and jewel toned linens. Maybe an outdoor party with hanging party lanterns and a tropical tiki bar. What ever you decide make sure it reflects your personal sensibility. Know your budget and work it! 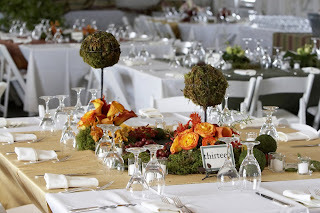 This helps determine exactly how many decorations you can have at your wedding or reception. It’s likely that equipment and decorations will be the next to the last thing you purchase or rent. Careful budget planning and execution will help avoid unwanted stress and disappointment. If your budget it tight think about renting the more expensive pieces you won’t reuse. Some rental equipment companies you work with may even be willing to purchase reusable items after your event. Take pictures of your event site. We know you’ll be watching “Who’s Wedding is it Anyway” and Googling pictures of your wedding ideas. You can easily overwhelm yourself with great ideas! Taking pictures of your event sites allows you to look back at the site to visualize if your idea will work. It also helps your wedding planner and/or vendors share your vision for the big day. Less is more. Many venues at the Crystal Coast are already festive since many of them are local attractions or locally owned and operated. If you are having a 4 course meal your reception tables will already be crowded with place settings, you may only need one tall centerpiece instead of a centerpiece and candles. The natural beauty of the beach only needs enhancing during your ceremony with maybe a few decorative starfish hanging from a beach bench or chair. With thorough planning and a little creativity you can plan the wedding of your dreams, not break the bank and give your guests an affair to remember. Very impressive post!! Great to know about these wedding décor tips. Was really in need of such ideas as have been planning my nephew’s wedding at one of Los Angeles wedding venues. Going to implement some of your ideas there. Thank you so much for sharing them.